We surveyed 40 senior executives – CEOs, COOs, Principal Partners, and owners – from the leading residence and citizenship by investment consultancies around the world (not including China) to learn more about the trends shaping the investment migration market. Going forward, we intend to make this an annual survey which, we hope, will provide unique insights into the market as a whole and the participants within it. While the sample size of our initial survey is small (getting people to answer a questionnnaire is a thankless task), the size of the companies surveyed – as well as their internationally diversified program portfolios – makes it a highly representative selection. We expect to have a much larger sample size next year. Factors skewing the results: Most of the firms surveyed are global RCBI-consultancies. We excluded local advisories such as law firms and real estate developers from the survey as these typically specialize in only one or two programs. This means that highly popular programs like the Greek, Portuguese, and Spanish Golden Visas, as well as EB-5 and QIIP – which are generally processed by local companies – are underrepresented in the survey. Dubai is the RCBI-hub: Fully 30% of RCBI-consultancies surveyed were headquartered in the UAE. The RCBI-business is booming; a majority of firms surveyed indicated they would open more offices, hire more staff, and expand into new markets in 2018.
Business is growing: Four out of five companies said they planned to hire more staff in 2018. See our job listings page for available positions in the RCBI-field. Taking up more office space: 72.5% of companies surveyed expressed an intention to open on or more new offices during 2018. More than one third said they planned to open an office in the Middle East, and a quarter said they were eyeing Southeast Asia. Middle East is the most important client source: Nearly half of companies surveyed said the Middle East was their largest source market. 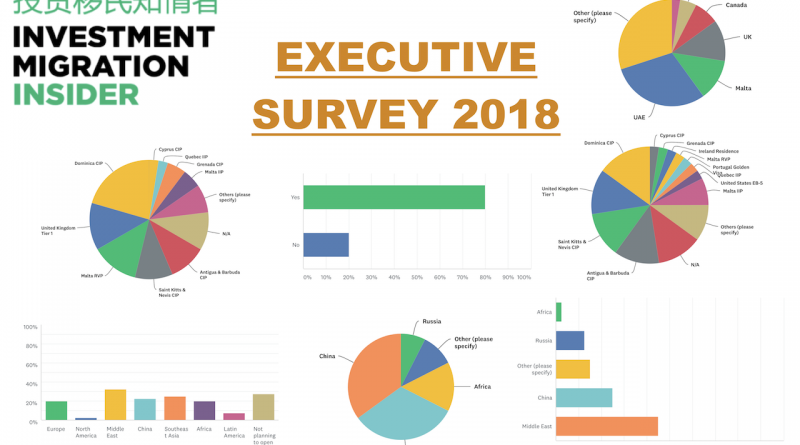 Here, the results are likely skewed due to the lack of EB-5 companies participating in the survey; Chinese applicants account for about 2/3 RCBI-program participants worldwide. Emerging RCBI-markets: 35% of firms say they want to expand activity in China, 32.5% in the Middle East. Perhaps more noteworthy was that while twice as many companies expressed an interest in improving their footprint in Africa as in Russia. 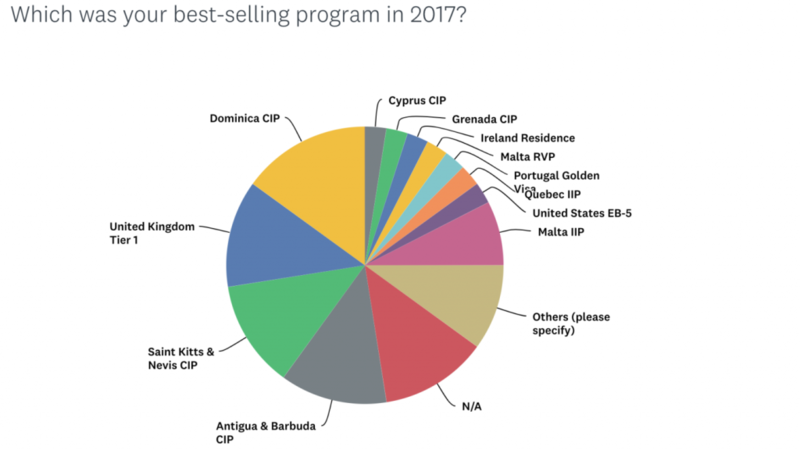 Dominica CIP a big hit in 2017: 15% of firms said Dominica was their best-selling program last year, closely followed by Saint Kitts and Antigua. 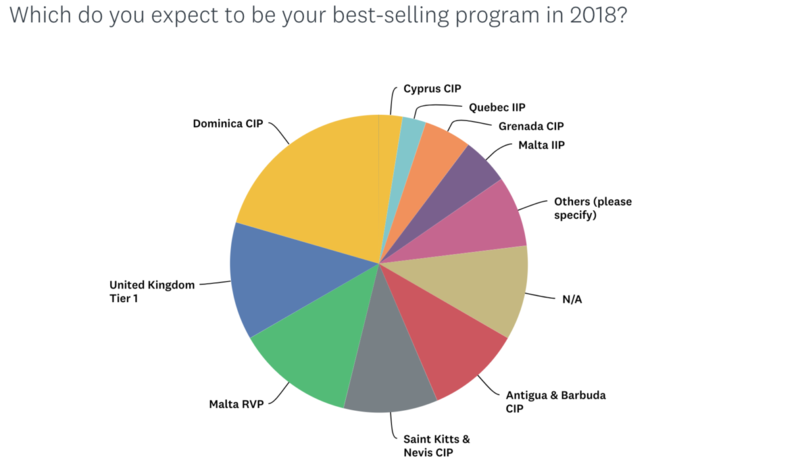 Dominica expected audience favorite in 2018: More than one in five RCBI-executives anticipated Dominica would be their biggest audience favorite in 2018, followed by the UK and Malta. Investment Migration Insider will be back with a bigger, improved survey in 2019. To make sure you don’t miss it, make sure you subscribe to our newsletter below.